SandRidge Energy Inc. revealed in an SEC filing that it was the target of a federal grand jury probe, which sent investors running for the hills. 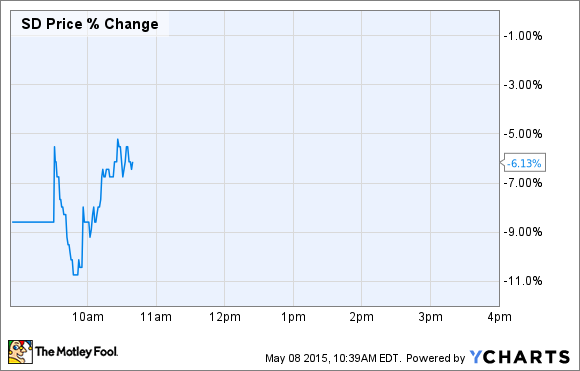 What: It has been a rough couple of days for SandRidge Energy (UNKNOWN:SD.DL) investors. First, the company reported poorly received first-quarter results Wednesday evening. To make matters worse, it then revealed in its 10-Q filing Thursday night that it is the target of an antitrust grand jury probe relating to how it leased oil and gas properties in Oklahoma. This revelation sent the stock down more than 10% when the market opened this morning. So what: The probe is part of an ongoing investigation of possible antitrust law violations by the company relating to the purchase or lease of land for drilling rights. The transactions in question date back to 2012 when the company was led by former CEO Tom Ward. The antitrust accusations are similar to those brought by the government against Chesapeake Energy (NYSE:CHK) and Encana (NYSE:ECA) over the past year due to their leasing practices prior to 2012 in the state of Michigan. The interesting connection between the two is the fact that Ward co-founded Chesapeake Energy with Aubrey McClendon before he took over SandRidge. This hints that there is a connection to his alleged aggressive tactics and those allegedly used by Chesaepake. That said, Chesapeake and Encana have now both settled their case in Michigan, without admitting to any wrongdoing. So, it remains to be seen if the next target of the U.S. Department of Justice, SandRidge Energy, will see its case end with a similar fate. Now what: Given the fact that Chesapeake and Encana recently settled an antitrust suit in Michigan for a total of $30 million suggests that this is likely a minor issue for SandRidge. However, that doesn't mean that issue won't drag out for a while, nor does it mean that SandRidge didn't do anything wrong. That said, SandRidge has many more pressing other issues to address, chief among which is its ability to grow amid weak oil prices.